Inventory We are a resale marketplace, not a box office or venue. Ticket prices may exceed face value. This site is not owned by BOK Center . 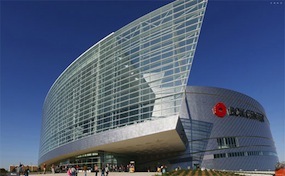 The BOK Center Tulsa, Oklahoma opened August 31, 2008 with a Sam Harris hosted community Choir. The 19,199 seat venue is located right at 200 South Denver in Tulsa and was built for $178 million in public funds with another $18 million in private sector upgrades. The BOK Center Tickets accommodates a large variety of events from concerts to sports. The Bank of Oklahoma Center Box Office has played host to worldwide superstars like Paul McCartney, AC/DC, Elton John, Bruce Springsteen, Metallica, Celine Dion, Kenny Chesney, Billy Joel and more. CenterTulsa.com is a privately held company that specializes in the sale of tickets in the secondary market. We are not affiliated with any official supplier or box office. To purchase tickets to any Bok Center in Tulsa events simply call our operators at anytime or click on the event you wish to attend.